I am back home and have notified the 4 people whose computer skills class I had to cancel last week. I have sent emails to all of them and hope to have a class on Friday 4/2 and Monday 4/5 both at 1pm. Any takers? Be sure to check out the computer skills blog at Computer Skills Blog . 2 weeks ago I mailed membership checks to the Chicago GS and the Lake County GS in Illinois. Yesterday I was googling some old family addresses in Chicago and found the house that my parents and sister lived in just before I was born - for sale $90,000 with pictures and a few details. I'm hoping to "visit" some of these places when I go to Chicago in June. With google I could "travel" down the street and find my way to the closest Metra station (4 blocks away). My plan is to take public transportation (my hotel is in The Loop), but I'm concerned about personal safety. So, this morning before I even had a chance to eat breakfast, I get a phone call from the membership chairman of the Chicago GS. I ask her if the Beverly neighborhood is a safe place to walk. She replies - "I have a good friend who lives on S. Charles St in the 9900's block". I said my family house was 9938 S. Charles - small world. She then offered to pick me up and drive me so she could visit her friend. She also is giving my contact info to her friend. Wow! If any of you class mates are ever in the SF/Oakland area with some time to spend on research, I have been very successful with the following locations mostly specific to SF/Oakland. The California Genealogical Society and Library in downtown Oakland calgensoc.org is a great place to get info about the city and people. They have the actual city directories dating back to the 1800's and I was able to determine from them when my family actually changed their name from Madsen to Mathiesen, they also have the city voting registers which helped as well to pin it down. Another valuable to me research tool was the SF Chronicle newspaper on microfilm which helped me find an article about my Great Grandfather. The staff is helpful but also lets you alone if that is your wish. They charge $5 for non members to use the library and they have the usual computer stations with access to various data bases. Saturday is the best time to go as parking in the lot across the street is free or it used to be. The building in which the library is housed is the restored Breuners Dept. store which is an art/deco structure. I remember it well as a child growing up in Oakland . The library is in the basement but it is still a great place to visit, check out their web site. The next place that has been a real research bonanza for me is the SF Maritime Museum Library (J.Porter Shaw Library) located at historic Fort Mason on the SF Bay near Fisherman's Wharf http://maritimelibraryfriends.org follow the link to the library. You have to call in advance to make an appointment and the whole sequence of events leading up to actually getting an appointment is a little eerie ( who are you, what do you want?) which I attribute to the librarians spending way to much time indoors with their heads in books, but it is well worth it if you get in.....anything you want to know about SF Bay you will probably find out here. I found info about my Great Gandfather and and the ferryboat on which he was a skipper in the Bay, great stuff. Also an easy walk from Fisherman's Wharf or free parking in the Safeway lot across the street. This only scratches the surface of research possibilities in the Bay Area, but I believe if anyone has research needs specific to this area, it would be a great start. Guess I have never thought of myself this way before, but I’m probably an “Inbox Genealogist”. A good part of my genealogy research each day is determined by what I find in my email that morning. So I went back and checked the 1930 Census record and her cousin had correctly interpreted the record. It said Mxxxx’s mother was born in Ireland. So did the 1920 Census record. However, whoever answered the census taker in 1910 and 1900 at Harry’s residence, said that his mother was born in Ohio. So, who do you believe? Well, I’ve found mom in the 1860, 1870 and 1880 Censuses. In each case she was reported as having been born in Ohio. In addition grandpa was reported to have been born in Pennsylvania and grandma in Virginia. I don't have nearly enough information to validate or discredit the Boleyn tale. However, I believe I have more than enough information to report to my client that if there are Irish ancestors in this line, they are a few generations further back than her great-great-grandmother. I guess this is another validation of Dr D's rule-of-thumb, "When you see the same thing in THREE consecutive censuses, you can start to believe it." Let's see, what else in in my Inbox? My own current activities in 17th Century Virginia are a mixture of “harvesting” and verification. “Harvesting” is collecting the pedigree charts that have been posted by other family historians. While these can give one a sense of direction, they vary greatly in reliability. I started my most recent round of collecting information on the families I thought I descended from in early Virginia last summer in Salt Lake City at the Family History Center Library. I continued in January at the New England Historic Genealogical Society (NEHGS) Library in Boston. This latter institution is sometimes called “HistGen” by insiders. Sarah Jessica Parker visited this library in the first episode of WDYTYA as she began to move back her line to her Salem witch. I have continued to add information to my piles from Internet searches for pedigree charts, family focused forum such as those found on GenForum, and sites about early Virginia. Now I am trying to organize and evaluate the piles of data and perhaps create a priority research “to do” list for a June trip that will take me to the DAR Library in DC and possibly the Library of Virginia in Richmond. 3. King Henry I, of England (abt. 1068-1135) is my 30th great-grandfather. Of these three “finds”, the cousin connection to Jefferson and the biological link back to Henry seem to be pretty well documented. The links in my connection to Thomas Farmer who arrived in Jamestown in October 1616 seem to be credible but I continue to look for more solid documentation. One other connection that is somewhere between fantasy and possibly true is a biological connection to John Clark(e) who was pilot of the Mayflower. Clarke Island in Plymouth Bay is said to be named for him. He made several voyages across the Atlantic prior to his death in the early 1620s in Jamestown where he had apparently decided to settle. I may never know if he was one of my ancestors. His line of descent is still much debated. As requested by Dr. D, thought I'd better get on the ball and start sharing. First up is progress on the Arroyo Grande Genealogy Library progress. We're almost done cataloging all the books and getting them in a data base on the computer! Just a few more categories left then we're done! When complete, the shelf list will be accessible online at the SLOCGS website. Currently the old list from 2007 is there. We have organized the AG list into smaller groups & have assigned subject categories so searching for particular topics should be easier. One thing we have learned, though, is that we are quite lacking in many areas. For some states we have no books at all and for others there's less than 5 items. Our international section is also very, very thin. So if anyone has any material that they are finished with and would like to donate it to the AG Library, we would gladly accept it! No sense in cluttering up your home. Plus, if you ever need to use it again, you know where it is! We've also wondered about the days & hours that the AG Gen Library is open. Traditionally, it's been open on Tuesdays & Thursdays from 1pm - 4pm. Would there be any interest in this library being open during any other days or times? This library is the only genealogy library between Santa Maria & San Luis Obispo so we don't know if people would rather go to the larger libraries or stay local & possibly get some help but not as much resources. We have met some quite interesting people in the library! One was a direct descendant of John Price. And yesterday a man came in looking for info on his great grandfather who had lived in Pozo, which was originally call San Jose. Well, that's all for my first post. Hope to see some new faces at the AG Genealogy Library! Matthew Broderick will be featured tomorrow night at 8 Pacific on WDYTYA? on NBC. His quest will take him back to the Civil War and Gettysburg and beyond. How are you enjoying this series? Please post your mini-reviews! My major genealogical activity this week is to try to stitch together my 17th Century Virginia ancestry. Those of us who have New England colonial ancestors are spoiled. Most of the early towns there kept meticulous records and most of them have survived more or less intact. Virginia, in the first century of settlement was a colony of a different color--genealogically speaking. Few of the records of the first half century--if they were kept--have survived and the second half century is only marginally better. "Several Virginia counties, most of them in the eastern part of the state, have suffered tremendous loss of their early records during the intense military activity that occurred during the Civil War, and others lost records in fires. At some point, almost everyone conducting genealogical or historical research will face the problem of finding information from a so-called "Burned Record county." Burned record counties might be grouped into three basic categories: Hopeless, Almost Hopeless, and Difficult. Included in the Hopeless category are James City, New Kent, Buckingham, Nansemond, Dinwiddie (before 1782), Appomattox, Buchanan, King and Queen, Warwick, and Henrico (before 1677). Almost Hopeless are Hanover, Prince George, Elizabeth City, and Gloucester. Difficult counties are Caroline, Charles City, King William, Mathews, Prince William, Stafford, Rockingham, and Nottoway." "Henrico: created in 1634 as an original shire, all county court records prior to 1655 and almost all prior to 1677 are missing; additionally, many isolated records were destroyed during the Revolutionary War, and almost all Circuit Court records were destroyed by fire in Richmond on 3 April 1865." When I encountered this situation a dozen or so years ago, I made a half-hearted attempt to verify the myth that my ancestress, Ann Farmer who was born in 1728, had an immigrant ancestor who came to Jamestown before the Pilgrims arrived at Plymouth. I was able to find that a Thomas Farmer did arrive in Jamestown in October, 1616 aboard the Tryall. However, whether or how Ann may have descended from him was beyond the records I could then find. I stitched together a possible connecting line. However, I was not very comfortable with it. I guess my ancestors were not yet ready to reveal themselves. Recently I have been collecting data from the Internet and from printed sources in libraries. I am now trying to stitch it together. More on this effort tomorrow as the process continues. "I am prepping for a trip to N. Ca and into Oregon and Washington. In Washington, I will be visiting at least 2 of 3 first cousins I've not seen in 55 years. I started looking for them in one of Dave's first classes when I learned about ZABASEARCH and Google-Maps; 2 of the 3 had relatively common first names, and I only knew the third as "Buddy" and the searches never revealed a Buddy. Finally, my aunt in Santa Maria revealed that he and his wife always sent her a box of fruit (apples and pears), and she thought his real name was "Merrill". So, I sat and figured the only area that coincides with apples and pears simultaneously is the north west USA so I narrowed things down and finally found Merrill in Vancouver WA. He told me his next younger brother Bob, also lived there in Vancouver, and the youngest lives in Great Falls, Montana and may be able to get to WA, so I am planning to have a nice reunion." "These cousins I am going to visit apparently visited with my father's half sister in Fresno, although he did not know of her until about 1950 or so; she was the child of my dad's father and some other woman after my dad's mother tossed him out for fooling around with her "best friend" shortly after 1910. Aunt Ruth died in Fresno about 10 years ago and I have not yet tracked her death certificate down to get the name of the woman who was her mother (my grandfather's second wife or mistress); the clan appears to have been very secretive about who did what with whom and there is little written that I have found. So far, nothing about grandfather after the 1910 census, and a pointer to his death shortly before 1920. 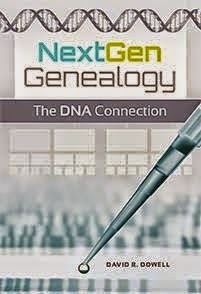 I am hoping the cousins may have some info that their father (my dad's brother ) maintained and perhaps I can get more family links confirmed." Check back in a couple of weeks for an update on Mike's quest in the Northwest. It was very enjoyable with a great view. I learned alot and now need to practice. Thanks. Lisa Kudrow is the focus of tomorrow's episode of WDYTYA. Lisa, of Friends fame, rides an emotional roller coaster as she explores the impact of the Holocaust on her family. Is there a happy ending? "WDYTYA has proven very powerful in recruiting future genealogists! I have three grown children and only the youngest has shown even a mild interest in genealogy. However, WDYTYA has become a favorite TV program of her children - girls aged 9 and 6. The girls will not be home this Friday and insist it be taped; a must not miss program. The older one has been taken with the ties to history of the first two programs - she "knew" the people and was amazed at the history that unfolded. The younger one was spellbound by Emmitt (for her, from both football and Dancing with the Stars) and his journey back to his roots in Africa. After going to bed, she came back crying. She wanted to know more about the selling of children, and why someone would do that. Mom said that provided an excellent opportunity for a very positive discussion. Both girls have talked about the programs with their classmates. The net impact - totally positive - has been to interest a new generation in learning about their anccestors and where they might fit with history. WDYTYA is a powerful recruiting tool for now and the future." Actress Glenn Close appears to have become the first woman to have her entire genome mapped. At least she is the first to publicly announce it. If you watched the series Faces of America, you may recall that Louis Henry Gates, Jr., the host of the program, had this done for him and his elderly father. In that segment it was stated that by overlaying the genomes of the father and son, they could deduce what the deceased mother's genome would be. This process is reported to have cost $500 million when the first human genome was decoded in 2003. Now, if you have some loose cash, you can get a real bargain for only $48,000. Jay Flatley, president and CEO of Illumina, the lab which conducted Close's test. "We are entering a new era in genomic health where information from an individual's genome will increasingly inform lifestyle decisions and ultimately assist with health management." Diane K, Ken and Edna came to my first 'computer skills' session at our home. They successfully navigated through the registration of the Blog and posted their first Blog. Congratulations! Hi, I figgered out how too Post yea. About this title: ," this comprehensive how-to guide for conducting genealogical research includes where to find census information, how to track down immigration documents, and more." Also included in this 200+ page book. as a glossy centerfold section, is an unnumbered 24 page supplement summarizing the stories of what each of the seven celebrity biographees discover during their on-camera adventure. The book is available from most bookstores, both storefront and online including Amazon, Borders, Barnes & Noble, etc. Many of you saw the author when Megan presented several sessions last month at the San Luis Obispo County Genealogy Society Seminar. She also appeared briefly on camera in last Friday night's episode when Emmitt was getting ready to follow up on his DNA results. For those of you who can get the BYU Channel on your cable or satellite TV (this is Channel 374 on our DirecTV), you may enjoy the Generations Project. It is sort of a WDYTYA featuring ordinary people. Of the several episodes we have watched, most have been very interesting. A couple have been less interesting and in one case there seemed to be about 30 minutes of content poured into a 60 minute slot. However, in fairness, there are no ads except at the beginning and/or end. As a result, there is more content to fill than on regular network TV. The new show each week seems to air at 7:00 PM Pacific time Monday nights and then repeat on Saturday at 12 PM, Sunday 10 AM, Monday 11 AM and finally at 5 PM--just a couple of hours before the next episode debuts. Welcome to Dr D's Blog. I was asked in class this week for assistance in finding the current location in Chicago of a street address from the 1890s. Chicago did not come up with its current numbering grid for streets until about 1909-1911. Prior to that there was a hodge-podge. In the standardization all north-south numbers were measured from Madison and east-west numbers were measurd from State Street. In the process, many streets even changed names. During this process your ancestors may have appeared to move but really stayed in the same location. Http://ChicagoAncestors.org is a wonderful site for those researching Chicago that was created by the Newberry Library--a privately funded library that is one of the best locations for researching Chicago area ancestors. From the home page one can enter a street address and it's location will be highlighted on a city map. From the TOOLS tab it provides a gateway to many free digital resources including historical maps, selected city directories and much, much more. Included are two downloadable documents about the street renumbering. Also, try clicking on the city map on the homepage. You can then explore the neighborhood in which you have landed. If you have Chicago ancestors, check it out and explore the various links provided. This is a great site for searching online and for planning a Chicago research trip. I would like to welcome Nancy and Sharon to Dr D's Blog. You are the 2nd person to accept the invitation to Dr D's Blog. Welcome! We hope you have some interesting finds or tricks to share. My longest standing brick wall is the origins of my 6th great-grandfather, Philip Dowell who died in Maryland in 1733. I have known about Philip since the 70s when my dad took me to visit a distant cousin of his who turned out to have a typescript copy of a Dowell family history done by an even more distant cousin. Over the ensuing years I have been able to uncover a lot of information about his adult life as a tobacco planter in Southern Maryland. I've visited the church that is on the site of his 1702 marriage to Mary Tydings. I've walked on 80 acres of land still owned by a sixth cousin-once removed which was part of 320+ acres that Philip purchased in 1722. However, in all the ensuing years, I have, yet to find convincing evidence about the origins of Philip and how he got to Ann Arundel County, Maryland in the 1690s. When J.E. Dowell speaks, I listen. He has been researching the Dowells several years longer than the four decades that I have been. He is the one that I was trying to match when I first DNA tested in 2004. We had been exchanging information for years and knew that his earliest documentable Dowell was in Virginia in the early 1700s. It was so logical that we had a common ancestor. One could have easily sailed down the James River in Virginia and up the Chesapeake Bay in Maryland or vice versa. That was the way that goods were brought in from England and tobacco was exported back to England to pay for it. So, after decades of futile efforts to find our missing link, we decided to DNA test to prove we were on the right trail. Wrong!! According to DNA evidence J.E. and I have not had a common biological ancestor on our paternal lines for at least 3,000 years! However, we remain research colleagues and help other Dowells sort out from which branch they descend. So when J.E. made that post, I paid attention. I went to http://books.google.com and discovered that Google has digitized that book but only the first 23 pages can be searched online. I then turned to http://worldcat.org and found that the closest library to me which owned the book was about 45 minutes away in Santa Maria. I induced my wife to accompany me by promising her a nice lunch and the possibility of visiting a mall that is not often on our path. Turns out that the reference was to an event about which I already knew--Philip's "purchase" in 1716 of an indentured servant by paying for his passage when the ship arrived in Maryland. I did learn one small detail about that event that I had not previously known, but my brick wall remains firmly in place. Don't miss the second episode of WDYTYA Friday night on NBC at 8 Eastern and Pacific. That's KSBY on the California Central Coast. This episode features Emmitt Smith whose football career kept him from family reunions until 2005. Now he is trying to make up for lost time and says "You need to understand where you were to appreciate where you are." After a journey back through slavery to Africa, Emmitt concludes "History is not his story anymore. History is really my story now." You are the first one, other than Dave, RaggZ and me, to join this blog. Welcome. Check out the teaser to the episode featuring Emmitt. Note: You are receiving this e-mail because we believe you are a member of the genealogy community or thought you might be interested. This blog grew out of the conversation today in the last session of the spring in Cuesta's Emeritus College Genealogy Research Class. It will be a place for those who have been students in that class over the last couple of years to continue to help each other in a community learning environment. This is a place to share successes, learning opportunities, and brick walls with colleagues. 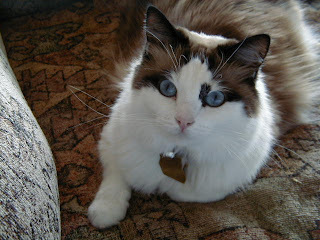 I am trying to find my Ragdoll ancestors. Here is what I look like. I am confused about my ancestry because I read on the internet that Ragdolls were created by some 'over the fence' connections back in the 1970's. I am not sure I want to face that fact! Who is my Great Great Grand Daddy really?? ?